Ooty, one of the popular hill stations of the country is rightly referred as the "Queen of Hill Stations". 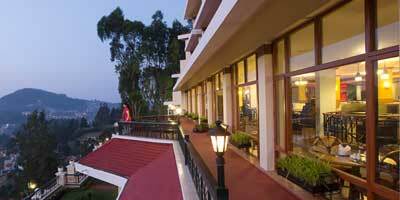 Ootacamund (Ooty) is located at an altitude of 2286 m in the Nilgiri District of Tamil Nadu state. The hill station of Ooty is a place worth visiting attracting all kinds of tourists and their wide range of interests belonging to different age groups and with varied purposes of visits. Ooty offers its visitors with best of natural setting along with luxurious accommodation facility and wide range of shopping options. The hill station also have varied kinds of adventurous sports to keep tourists entertained throughout the trip. The hill station makes for a perfect break from the hustle bustle of city offering you with enough options to relax with mesmerising nature all around you. Calm lakes, refreshing waterfalls, beautiful gardens, exceptionally rich flora and fauna along with availability of modern facilities creates a perfect setting to spend some memorable moments with your loved ones. There are many Ooty Packages from Delhi available in the market for tourists to choose from. However, to be sure of an enjoyable vacation is important to select the right kind of tour package and have complete knowledge of the place. Going with a reliable service provider can be a good idea. Ooty Planet, an important part of Holidays DNA presents its tourists with wide range of Delhi to Ooty packages. Ooty and Delhi are well connected to each other via airways and railways. Coimbatore airport is the nearest airport to Ooty. There are flight from Delhi to Coimbatore. The nearest railway station to Ooty is Mettupalayam. Tourists can either hire a taxi from Coimbatore and Mettupalayam or take a bus to the hill station. There are regular buses running between Ooty and Coimbatore as well as between Ooty and Mettupalayam. At Ooty Planet, there are various kinds of tour packages catering to different trip purposes of tourists and their budget limits. Some of the Coimbatore Delhi packages offered by us are Honeymoon packages, family tour packages, adventure packages, business tour packages and many more. And if you are looking for a vacation which is exactly in the way you want it to be, you can tell us. We at Ooty Planet, offer customised Delhi Ooty packages for all types of vacation and ensure that we offer with best of the facilities without going over your budget. Along with all these, we also present our tourists with information on aspects such as ooty resorts and hotels as well as suggestions on the best time to visit Ooty, details on sightseeing commuting within the hill station, etc. One of the popular hill stations of the country, Ootacamund (Ooty) lies beautifully at altitude of 2286 m in the Nilgiri District of Tamil Nadu state. Popularly called as the "Queen of Hill Stations", Ooty boasts of amazing holidaying setting with its soothing environment which promise a relaxing and refreshing break from the hustle bustle of day to day lives. Serene lakes, lush green tea gardens and dense forests of pine trees and eucalyptus trees, captivating waterfalls along with umpteen options of adventurous activities and a calm environment, all together make Ooty a place worth visiting at least once in lifetime. Ooty presents an amazing break from the chaos and hustle bustle of city life. Delhi, the capital city of India is well connected to Ooty and thus it is not at all a hassle to reach the hill station. The distance between Ooty and Delhi is close to 2,341 km. The nearest airport to Ooty is Coimbatore airport which is well connected to Delhi. The nearest railhead is Mettupalayam. There are regular buses and taxi available from railway station and airport to Ooty. The hill station is also linked to other tourist destinations like Mysore, Bangalore and Madurai. However, in spite of all these tourists need to have relevant Delhi Ooty packages catering to their requirements and budget which can ensure a hassle free vacation. An efficient service provider is something we all require for a memorable vacation! Isnât it? Ooty Planet which is an important division of Holidays DNA offers tourists with wide range of Ooty Packages from Delhi suiting all kinds of tourists and their requirements and preferences. Our travel experts create each and every packages with lots of care and after extensive research so that our customers don't have to face any problem while holidaying. There are varied kinds of Ooty Delhi tour packages offered at Ooty Planet. Some of these are Honeymoon packages, family tour packages, adventure packages, business tour packages and various other kinds. If very particular about their requirements, tourists can get their packages customised as well. We offer customised Delhi to Ooty packages for all kinds of trips and budget limits.